The floating network license version of the software allows the user to check-out a license from the network license pool to a laptop computer and use the software independent of the Network License Manager. This allows the user to use the software on a laptop at home over the weekend, on-site, etc. The user can specify the number of days that the license is checked-out from the network license pool. Once this time period is over, the license is automatically returned to the network license pool by the Network License Server. There is no need to check the license back into the network license pool. The minimum time period that a license can be checked out for is 1 day (24 hours), with the maximum time period being 7 days. 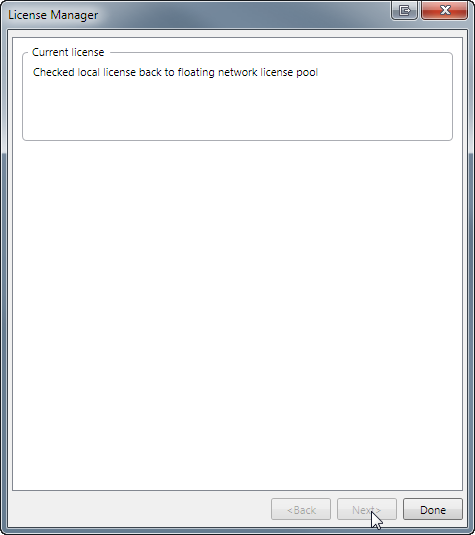 If desired, a checked-out license can be checked-in back to the network license pool prior to this time period expiring. An already checked-out license cannot have the time period extended without first checking the license back into the network pool. 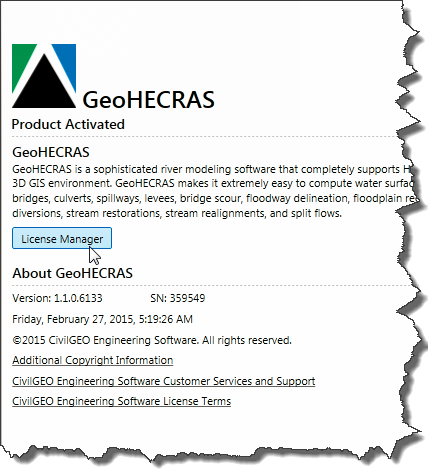 Note that this check-out license functionality is not available in the workstation license version of the software. How to check-out a license? 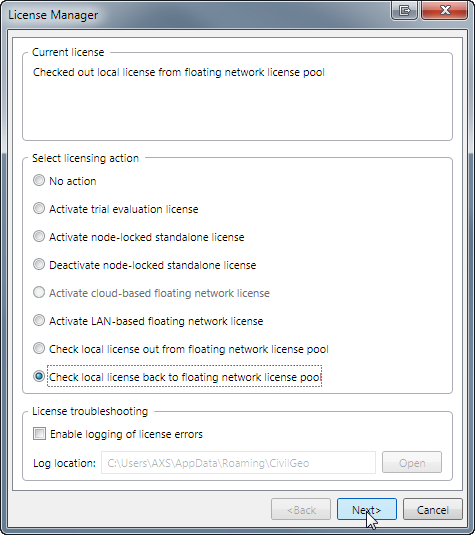 Choose the Check local license out from floating network license pool option. Click on the [Next>] button. The License Manager will display the following information. The network IP address and Port fields should show the location of the Network License Server and the port that the Network License Server is using. If not, then enter this information. Next, enter the number of days you want to check-out the license in the Number of days to check license out from the network license pool spin-control field. Click on the [Done] button to close the License Manager dialog box. Start-up the computer independent of the network that the Network License Server is running on. Start-up the software. Select File | Help. This will display the Help backstage page. You should see the license status as Product Activated and Subscription for the days remaining. How to check-in a license? The user can specify the number of days that the license is checked-out from the network license pool. Once this time period is over, the license is automatically returned to the network license pool by the Network License Server. There is no need to check the license back into the network license pool. However, if desired, a checked-out license can be checked-in back to the network license pool prior to this time period expiring. Start-up the computer on the network that the license server is running on. Start-up the software. Select File | Help. This will display the Help backstage page. From the Help backstage page, click on the [License Manager] button. The following License Manager dialog box will be displayed. 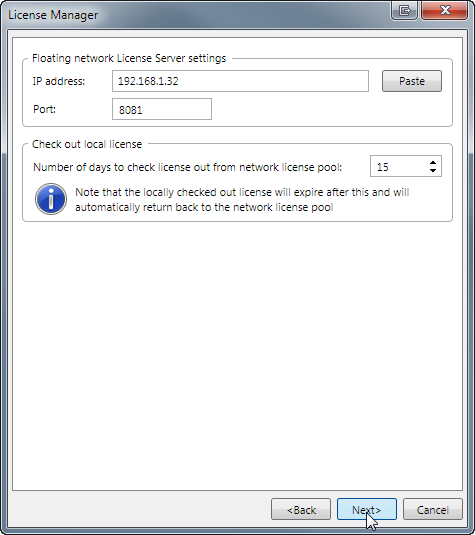 Choose the Check local license back to floating network license pool option. Click on the [Next>] button. You should see the license status as Product License Not Found, as shown above. Connect the computer back to the network that the Network License Server is running on.